So what is a “superfood”, anyway? The Macmillan Dictionary defines it as a food that is considered to be very good for your health, and may even help some medical conditions. The Oxford Dictionary definition states it’s a nutrient-rich food considered to be especially beneficial for health and well-being. A simple search for the word, reveals close to 10 million results—predominantly from health and nutrition blogs, online newspapers and magazines, and providers of so-called nutritional supplements. The term “superfood” was coined by the authors of a book called Superfood in 1990. If you really want to be a stickler about it, the concept of superfood goes all the way back to the 1950s when the world’s first superfood—spinach—was made famous by cartoon character Popeye the Sailor Man (this is a major fun, eye-popping Google) who inhaled tons of the green stuff for strength. Actually, there really is no legal or medical definition of superfood. But the term “superfood” has become a popular buzzword, today’s silver bullet for head to toe health—inside and out. It seems like a new superfood pops up every single day. Recent research found that 61 per cent of people have bought a food or drink because it had been labelled as a superfood. “Bought” being the operative word here. But more on that later. The term “superfood” is not regulated by the Food and Drug Administration. Still, the world is in a current frenzy over superfoods. But in a world of growing health paranoia, many think superfoods are a gimmick, a murky, magical panacea created by dollar-hungry and extremely clever marketing mavens who use the same aggressive techniques to sell superfoods that it used a few years ago to convince us we would all have perfect bikini bodies if we ate little more than Snack Wells. 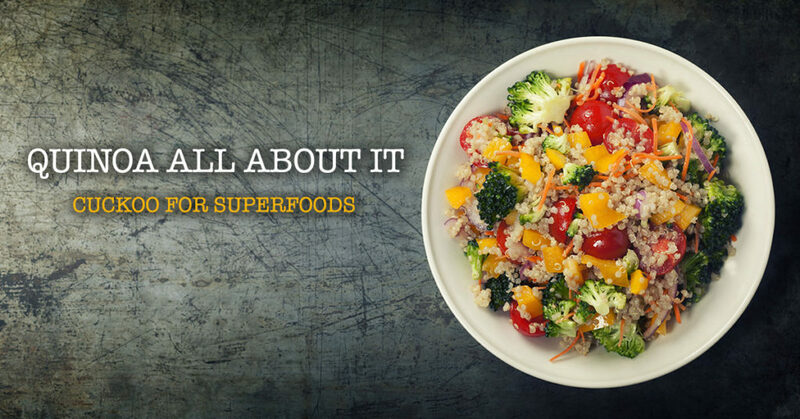 Promoted by the right people, superfoods fly off store shelves. And the public is eating it up (pun intended). Organic, good—non-organic bad. That’s what it’s come down to for the health-crazed looking to live forever. There is some truth to the organic “good” part of the equation (other than the shell shock at the cash register). Organic food refers to the way agricultural products are grown and processed. Organic crops must be grown without the use of synthetic pesticides, bioengineered genes (GMOs), petroleum-based fertilizers, and sewage sludge-based fertilizers. Organic livestock raised for meat, eggs, and dairy products must have access to the outdoors and be given organic feed. They may not be given antibiotics, growth hormones, or any animal-by-products. In addition, organic farming practices are designed to encourage soil and water conservation and reduce pollution. It’s important to know that “natural” and “organic” are not interchangeable terms. You may see “natural” and other terms such as “all natural,” “free-range” or “hormone-free” on food labels. These descriptions should be truthful, but don’t confuse them with the term “organic.” Only foods that are grown and processed according to USDA organic standards can be labeled organic. The thing to remember is that you don’t have to eat organic 24/7. Organic foods could give some people brain freezes when they see the prices. Relax. If you can’t afford to go organic just make sure you buy a variety of non-organic fruits and veggies, and wash them well. If there’s a Farmer’s Market near you, grab your biodegradable bag and go for it. YOU CAN TALK ABOUT THE MIRACLE POWER OF SUPERFOODS, BUT THERE IS REALLY NO EVIDENCE OR SUBSTANTIAL STUDIES THAT CAN PROVE THAT. IT’S A HIT OR MISS PLAN FOR OVERALL HEALTH. AND IT DOESN’T HELP BALANCE YOUR HORMONES. WHEN YOUR HORMONES ARE OUT OF BALANCE, YOU CAN BE PLAGUED BY A HOST OF PROBLEMS AND MEDICAL ISSUES. SINCE HORMONES ARE THE BODY’S MESSENGERS CONTROLLING HOW YOUR CELLS AND ORGANS DO THEIR WORK, UNBALANCED HORMONES LEAVE YOUR BODY OUT OF CONTROL. A SUPER SMART SOLUTION TO GETTING YOUR HORMONES IN BALANCE IS TO SEE DR. STEPHEN A. GOLDSTEIN M.D., F.A.C.S. AT DENVER HORMONE HEALTH. WITH SIMPLE TESTS, HE CAN MEDICALLY DETERMINE WHAT YOU NEED TO FEEL YOUR BEST. DEPENDING ON THAT, HE CREATES A UNIQUELY TAILORED HORMONE REPLACEMENT PLAN TO HELP WHERE YOU NEED HELP. READY TO GET ON WITH A SUPER LIFE? CALL NOW FOR AN APPOINTMENT. Looking for some recipes for success? They’re all over. Literally thousands online. And some as easy as using 5 or less ingredients. So don’t table your resolve. Here are some dishes you won’t be able to wait to dish into. Prepare 1 serving angel hair pasta (whole-wheat, if you can find it!) according to package instructions, about 10 minutes (including the time it takes to boil the water). Heat ½ tbsp. olive oil in a frying pan and cook ½ lb. peeled and de-veined shrimp seasoned with a pinch of salt for 3 to 5 minutes over medium-high heat. Remove shrimp and add 1 tbsp. olives (chopped), 1 tbsp. parsley (chopped), and 1 clove garlic (minced). Cook 1 minute and add 1 cup fresh baby spinach, ½ cup halved cherry tomatoes, ¼ cup chicken broth, and 1/8 cup white wine. Cover and cook 3 minutes. Stir in shrimp and serve with pasta. Preheat the broiler and bring a small pot of water (with a lid) to a boil (about 5 minutes). Add ¼ lb. asparagus (cut into 3-inch pieces) and ½ cup orzo to the pot. After 3 minutes, remove only the asparagus and continue cooking orzo according to package instructions (usually about 6 minutes). While orzo cooks, season 5 oz. salmon filet with salt and pepper and broil for 5 minutes, or until opaque throughout. Meanwhile, whisk together ½ oz. crumbled feta, ¼ tbsp. chopped dill, ½ tbsp. lemon juice, ½ tsp. olive oil, and pepper to taste. Flake the fish and toss together all ingredients. Caramelized onion, balsamic vinegar, and figs combine to create a subtly sweet topping for savory roasted pork. A side of acorn squash, available in peak form throughout the winter, rounds out this hearty meal. Combine first five ingredients in a bowl and add the milk and vanilla. Combine brown sugar and other 3 T unsweetened cocoa and sprinkle over the batter. Pour the hot water over this. DO NOT STIR! Bake at 350 for 40 minutes. Serve warm. Enjoy with no guilt. Place first 4 ingredients in a large bowl; beat with a mixer at medium speed until well blended (about 2 minutes). Add peanut butter, beating well. Beat in egg and egg white. Weigh or lightly spoon flour into a dry measuring cup; level with a knife. Combine flour, baking powder, and salt, stirring with a whisk. Gradually add flour mixture to peanut butter mixture, beating until blended (batter will be thick). Spread batter evenly in a 13 x 9-inch metal baking pan coated with cooking spray. Bake at 350° for 26 to 28 minutes or until a wooden pick inserted in center comes out clean. Place chocolate in the top of a double boiler set over slightly simmering water; melt chocolate chips, stirring until smooth. Spread chocolate evenly over top. Cool completely on a wire rack. Cut into bars. AS PEOPLE BEGIN TO AGE, THEIR BODIES BEGIN TO BE DEPLETED OF CERTAIN HORMONES. THIS IMBALANCE CAN DISH UP CONDITIONS AND ONGOING AILMENTS INCLUDING THYROID DISEASE, CHRONIC FATIGUE SYNDROME, SLEEPLESSNESS, MEMORY LOSS, MOOD SWINGS AND EVEN WEIGHT LOSS RESISTANCE. JUST TO NAME A FEW. BUT STEPHEN A. GOLDSTEIN, M.D, F.A.C.S. 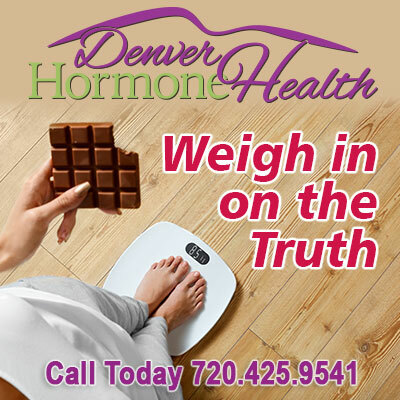 AT DENVER HORMONE HEALTH IS GETTING RAVE REVIEWS IN USING BIOIDENTICAL HORMONE REPLACEMENT THERAPY (BHRT) TO TREAT, RELIEVE AND EVEN PREVENT MANY ILLNESSES. THE PROCESS BEGINS WITH DR. GOLDSTEIN EVALUATING THE SYMPTOMS YOU ARE EXPERIENCING. WITH SIMPLE TESTS HE IS ABLE TO PROVIDE AN INDIVIDUALIZED THERAPY TREATMENT BASED ON YOUR PERSONAL NEEDS. PART OF HIS TREATMENT DOES INVOLVE EXERCISE AND DIET. BUT NOT DIET AS IN DENYING YOU OF EVERYTHING YOU LOVE TO EAT. CALL NOW FOR AN APPOINTMENT. IT’LL BE A WEIGHT OFF YOUR SHOULDERS. We’re playing a new kind of hunger game today. But it’s not one you have to fight to win. When it comes to what you weigh and how to eat, the first thing to do is order up a big helping of self-acceptance with a hefty side order of self esteem. Living in Denver means adapting to high altitude, and living healthy means adapting your thinking. Think small achievable changes, one step at a time. Think of the food pyramid like a mountain you’d like to climb. “I can do this.” You can. You don’t have to deny yourself anything. Just have enough of a taste to satisfy your cravings. Change the way you cook. Reduce fat, sugar and salt. It won’t reduce taste. We promise. Make healthy substitutions. Use whole wheat pasta, switch whole milk and cream for lower fat milk. (Skim milk makes a much frothier latte than using anything else.) Don’t avoid meat, poultry or fish, just cut back on portions and increase the amount of vegetables. Halve the amount of cheese in a recipe. Braise, broil, poach, sauté and steam instead of fry. A touch of butter doesn’t mean a full stick. And if you’re out, opt out of the bread basket and leave room for something your taste buds (and body) will thank you for. Think you can’t treat yourself at home. It’s easier than you think. Here are a few quickies there are always time for. Spread 1 oz. light cream cheese and ½ tbsp. horseradish on 1 whole-wheat wrap. Layer on 2 oz. roast beef, 1 oz. sliced cheddar, and a handful of romaine lettuce. Roll up and enjoy. Prick 1 sweet potato with a fork 4 to 5 times. Microwave on a paper towel or a microwave-safe plate for 4 to 5 minutes. Split open lengthwise and top with 2 tbsp. nonfat Greek yogurt, 1 tsp. honey, 2 tbsp. drained and rinsed black beans, and a pinch of paprika. AND YES… A square of Ghirardelli 60% Cacao Dark Chocolate. CHOCOLATE! ONE OF THE MOST IMPORTANT THINGS CONTRIBUTING TO YOUR OVERALL WELL-BEING ARE HORMONES. HORMONES ARE CHEMICAL STRUCTURES THAT ACT LIKE MESSENGER MOLECULES IN THE BODY; THEY HELP CONTROL HOW CELLS AND ORGANS DO THEIR WORK. IMBALANCE IN THESE HORMONES CAN LEAD TO A LONG LIST OF AILMENTS FROM MOOD SWINGS TO MENOPAUSE, FROM FATIGUE TO FIBROMYALGIA. NO ONE UNDERSTANDS THIS BETTER THAN STEPHEN A. GOLDSTEIN, M.D, F.A.C.S. AT DENVER HORMONE HEALTH. HIS EXPERTISE AND YEARS OF EXPERIENCE IN BIOIDENTICAL HORMONE REPLACEMENT THERAPY (BHRT) HAS IMPROVED THE QUALITY OF LIFE IN PATIENTS OF ALL AGES. WITH SIMPLE TESTING AND COMPREHENSIVE EVALUATIONS OF SYMPTOMS, DR. GOLDSTEIN CAN DETERMINE WHAT YOU NEED TO RE-ESTABLISH YOUR HORMONE IMBALANCE AND HEALTH. HE IS THEN ABLE TO CREATE AN INTEGRATED TREATMENT PLAN SPECIFICALLY TAILORED FOR YOUR NEEDS. CALL TODAY TO MAKE AN APPOINTMENT WITH DR. GOLDSTEIN. YOU’LL LOVE THE SOLUTIONS HE SERVES UP.